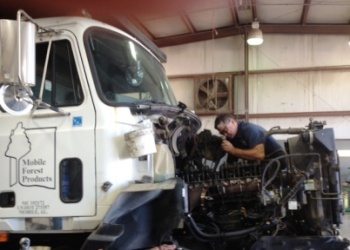 We have a team of qualified mechanics who ensure we run well-maintained trucks, trailers, and equipment. Mobile Forest Products & Biomass’s team of qualified mechanics ensures that we run safe and well-maintained trucks, trailers and equipment. Well-maintained equipment is a vital part of our safety commitment. Two maintenance shop locations: Mobile, Ala. and Waynesboro, Miss. Interested in career as a mechanic with MFP&B? Please visit our Career page.